Something Wild: What Happens to Trees in Drought? Something Wild: What Makes Summer Thunderstorms Happen? Something Wild: Do Mosquitos Like You Better? Something Wild: NH's Other Foliage Season is Now! Something Wild: Why Are Peepers So Loud? Something Wild: Thrushes, A Sure Sign of Spring! Something Wild: What Does the Vernal Equinox Do? 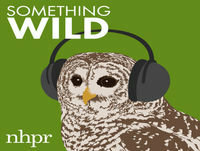 Something Wild: 20 Years and Counting!